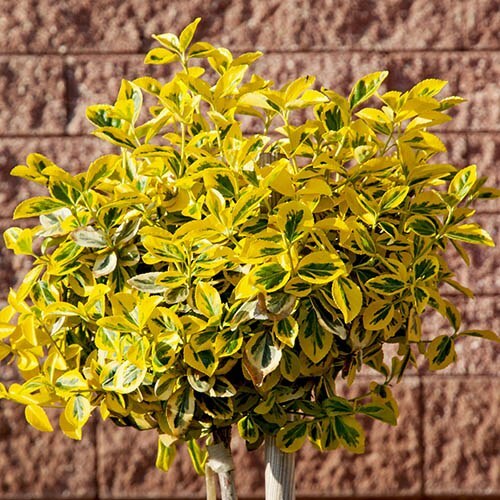 This lovely new selection of larger leaved Euonymus has bright gold-edged variegations, creating an evergreen ball of colour atop a straight standard stem. The fabulous golden yellow variegated leaves are brightest in new growth in Spring and Summer, yet remain neat and tidy too. And they are ever-yellow too - they remain bright all year, even in Winter, so offer a real year round feature. Grown on a clear stem of about 50cm, these standard Euonymus are quite unusual, and work really well as a low maintenance feature in pairs either side of a doorway or gate. Supplied in a 3L pot, a standard lollipop form tree, with a clear 50cm stem, and trimmed head, Height up to 1M tall inc pot.